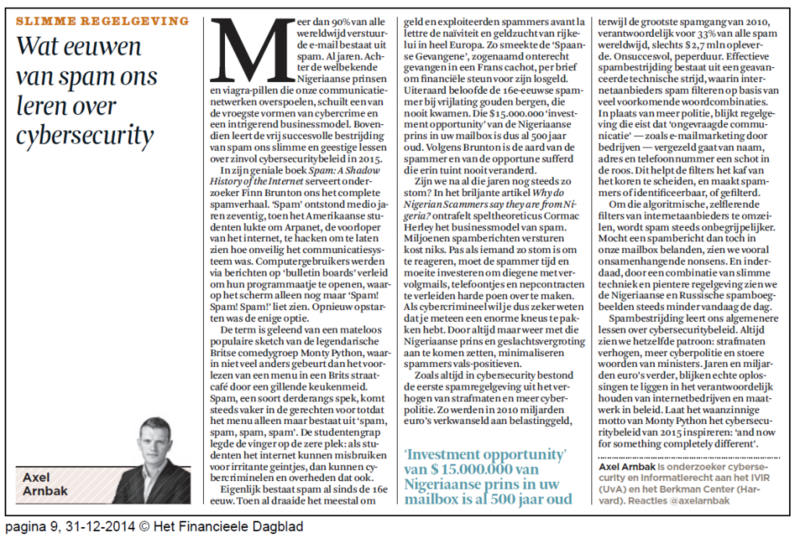 Op oudejaarsdag stond mijn vijfde column in het Financieele Dagblad. Het stuk beschrijft de geschiedenis van spam en trekt lessen uit deze eeuwenoude vorm van cybercrime voor cybersecuritybeleid in 2015. Met een vleugje Nigeriaanse Prinsen, Viagra en Monty Python on the side. I¡¦ve learn a few excellent stuff here. Certainly worth bookmarking for revisiting. I surprise how so much attempt you place to make one of these excellent informative website. yfifjepgj,Thanks a lot for providing us with this recipe of Cranberry Brisket. I’ve been wanting to make this for a long time but I couldn’t find the right recipe. Thanks to your help here, I can now make this dish easily. zvgzdroduc,Hi there, just wanted to say, I liked this article. It was helpful. Keep on posting! cpbzfl Yeezy Boost,Very informative useful, infect very precise and to the point. I’m a student a Business Education and surfing things on Google and found your website and found it very informative. yobyzbbi,Waw! Its really great and wonderful ever i found. Thank you for sharing this info. oqzyjbky,This website truly has alll of the information and facts I wanted about this subject and didn?t know who to ask. pfmrbwf Yeezy Boost 350,Very informative useful, infect very precise and to the point. I’m a student a Business Education and surfing things on Google and found your website and found it very informative. Great items from you, man. I’ve bear in mind your stuff previous to and you are just too great. far more from you. That is really a great site. cszkgivto,Very helpful and best artical information Thanks For sharing. Asking questions are genuinely pleasant thing if you are not understanding anything fully, however this paragraph gives good understanding yet.